The outgoing mayor says pension and healthcare costs could cripple the city. His successor thinks the labor mess the mayor is leaving him is a bigger deal. In a final major speech delivered to a friendly crowd at the Economic Club on Wednesday, Mayor Bloomberg said the biggest threat now to the survival of the city is the rising cost of employee pensions and healthcare. “Here in New York City, over the past twelve years our pension costs have gone from $1.5 billion to $8.2 billion,” he said. “That’s almost a 500 percent increase—when inflation totaled only 35 percent.” Healthcare costs for employees and retirees were also soarding. Together, the mayor said, those benefits costs represented a drain that has already dragged other cities into bankruptcy and will threaten the same in New York’s near future if we’re not careful. The complex the mayor is refering to is the sinister tendency of unions to support politicians who they like. 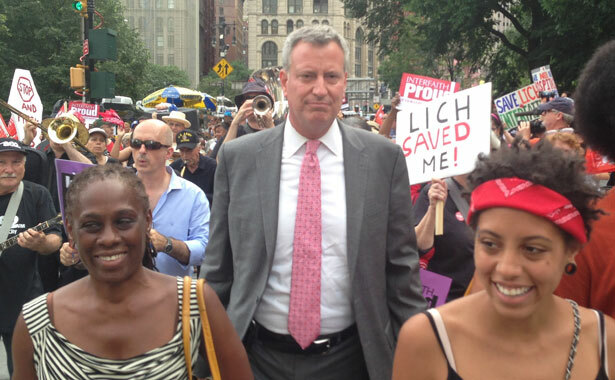 Not many big municipal unions supported Bill de Blasio in the 2013 primary (DC 37 backed John Liu, and the UFT went for Bill Thompson) but de Blasio is closely linked to the Working Families Party, which is backed by labor, as well as to SEIU-1199 and the Communications Workers of America. So insidious is the threat of the labor-electoral complex that Bloomberg himself succumbed to its spells more than once. In 2004, he granted a generous contract to DC37, the massive union that represents many municipal workers; in the 2005 campaign, DC37 endorsed Bloomberg. Also in 2005, he gave a sweet deal to the UFT, who coincidentally sat out that year’s election. The mayor apparently kicked the habit after his first re-election, bravely deciding in 2009 to rely only on his nine-digit campaign spending and the support of a small but hardy band of newspaper barons to get him a third term. Now. the mayor having gotten wise to their schemes, not a single municipal employee has a contract, leaving de Blasio with a towering stack of labor negotiations to work through. But that, says Bloomberg, is a good thing: Because he held the line against granting another contract that exacerbated that pension/healthcare problem, the mayor argued, unions were now desperate to get a deal and willing to compromise. The mayor’s logic is interesting. He claims on one hand that it would be horribly irresponsible for elected officials not to solve the pension problem. On the other, he argues that he’s performed brilliantly … by not solving the pension problem, and instead leaving it for his successor. Across town on Wednesday, de Blasio didn’t sound particularly grateful to the mayor for putting him in this enviable position. “We are going to be facing literally an unprecedented situation in the history of this city. We have never faced the fiscal stress created by having our entire workforce in a situation in which the contracts are not finalized and completed,” he said, adding that the contract situation will threaten his progressive agenda. That report also noted that, while health and pension costs are a big deal, the biggest cost factor facing the city isn’t pensions or medical costs. It’s debt service on all of Bloomberg’s capital spending, which is due to rise 15 percent in the next year to $6.9 billion on its way to $7.6 billion in 2017. It’s one thing for Bloomberg to say that health and pension costs are a concern—they are, and at some point the unions’ desires could undermine the rest of what the de Blasio administration needs to do. I don’t know if, in a city with 50,000 people in the homeless shelters, stagnant wage growth and nearly half of households at or near poverty, those costs are the biggest worry we’ve got. But you can make the argument that rising benefit expenses could hamstring our ability to respond to those other problems. But the idea that the mayor, by leaving his successor with a rising debt-service tab and dozens of unfinished contracts, has moved the city closer to resolving its fiscal imbalance—that’s more than a little self-serving. Mike Bloomberg has done many fine and sensible things as mayor, like the smoking ban, bike lanes, increasing the high-school graduation rate, bus rapid transit, the investigations of gun retailers, the tech campus on Roosevelt Island and so on. But putting his successor on solid fiscal footing is not one of them.